Do you have any old Lincoln pennies from the 1920s? Perhaps you’re looking for the 1922 penny value? Wonder if you have the rare 1922 plain penny or the valuable 1922 weak-D penny and want to know what they’re worth? These are questions we can answer for you in this post, so read on to find out what your 1922 pennies are worth! The 1922 wheat penny is among the scarcer dates of the long-running Lincoln cent series. Barely more than 7.1 million were struck. All 1922 wheat pennies were made at the Denver Mint. A lot of people initially thought that the Philadelphia Mint made 1922 pennies also — because some don’t appear to include a “D” mintmark under the date. As you may already know, Philadelphia didn’t place a “P” mintmark on pennies until 2017 — so any Lincoln cent from 1922 that doesn’t contain a mintmark would seem to have come from the Philadelphia Mint. Several theories circulate about the creation of the so-called 1922 plain pennies. The most widely accepted understanding is that several different die pairs (pairings of the obverse and reverse dies that struck the designs onto blanks that became 1922 pennies) were retooled. Back in the day, Mint employees would routinely retool — or repair — dies that became worn out. This helped prolong the workable life of a die, saving both time and money for the Mint. The most valuable of these die pairs is what collectors know as Die Pair #2 — the one that created the famous 1922 plain penny, or 1922 no D penny. 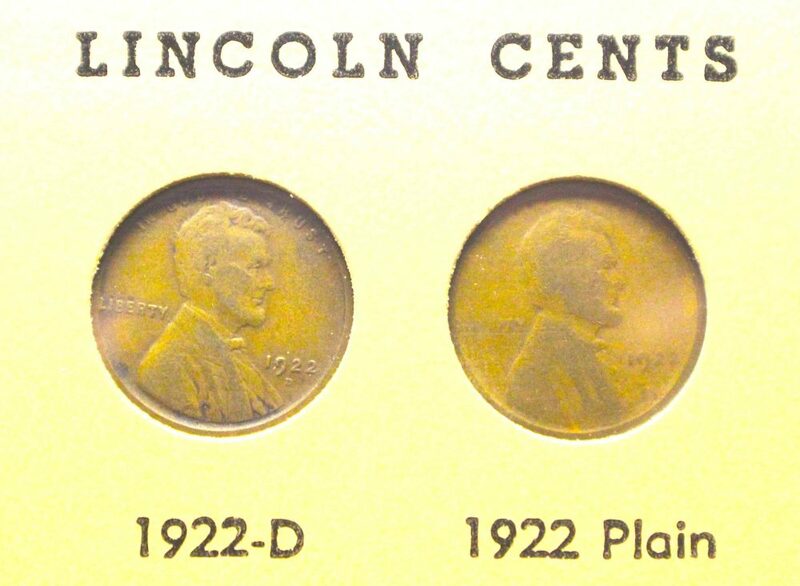 It is believed that the circumstances behind Die Pair #2 (the 1922 plain penny) occurred when a pair of obverse and reverse dies creating normal 1922-D pennies clashed together. The reverse die was likely destroyed when this happened, but the obverse die was still salvageable. To fix the damage to the obverse die, a Mint employee would’ve polished out the clash marks, removing surface metal. As a result, in the repair process, the “D” mintmark was unintentionally removed. This also left a somewhat washed-out appearance on the obverse die — meaning obverse details generally aren’t very strong on the 1922 plain penny. The reverse die, meanwhile, was replaced with a fresh die since the original was beyond repair. This is why authentic 1922 plain pennies have a soft-looking, or “mushy,” obverse and strong reverse. Note, too, that the second “2” in the date of authentic 1922 plain pennies is stronger than the first “2.” This is actually one of the most important diagnostic indicators of a Real McCoy 1922 no D penny versus counterfeits or the more common 1922 Weak D pennies. What Are 1922 Pennies Worth? So, what is your 1922 penny worth? The amount of the “D” mintmark that shows will really be the indicator of value. Weak D (or as some say, ghost D) 1922 pennies are worth more than normal 1922-D pennies. But the king of 1922 pennies is the 1922 no D plain penny. Rarest of all 1922 plain pennies are those that are uncirculated. These are truly rare coins worth thousands of dollars. You’ll be happy to know that any 1922 penny is relatively scarce, though the 1922 Weak D and 1922 plain pennies are far scarcer. *Values are for problem-free coins (no cleanings, holes, porosity, etc.) in circulated condition unless otherwise specified. Uncirculated 1922 pennies are worth significantly more than the prices listed here. What Else Happened When Your 1922 Penny Was Made? There were all kinds of things happening when 1922 pennies were made. It was the Roaring 20s, and many Americans were living it up — even if Prohibition laws that went into effect in 1920 made it illegal to enjoy alcoholic beverages. Many imbibed on good drinks and good times at hidden speakeasies, and some even crafted their own alcoholic beverages in clandestine basement and attic distilleries. The Lincoln Memorial, seen on the Lincoln penny from 1959 through 2008, was dedicated in Washington, D.C. on May 30. Benito Mussolini took over Rome and enforced a fascist government in Italy. The famous Reader’s Digest magazine was first published. Insulin, a hormone that regulates how the body processes sugar, was used to treat diabetes for the first time. British explorers uncovered King Tutankhamen’s tomb in Egypt. The Velveteen Rabbit, a famous children’s book authored by Margery Williams, was published for the first time.